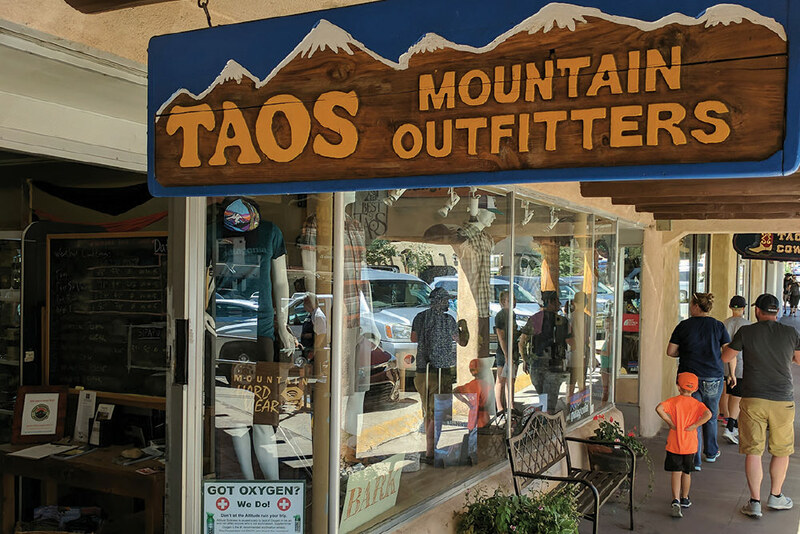 When Bill Gaydosh took over the 49-year-old Taos Mountain Outfitters (TMO) two years ago, he knew he needed to make the store an outdoor destination for locals and tourists. First that meant absorbing The Good Sole, the standalone shoe store located across the street, for a unified identity. Being an outdoor specialty store also meant dropping fashion comfort brands from its mix in favor of more trail runners and hikers. “We used to sell some high heels, but we dropped those lines because they didn’t sell until they were on sale,” Gaydosh says. “Margins hold the boat up, and we couldn’t afford to only sell things when they were on the sale rack.” Now the 400-square-foot shoe section boasts a bevy of styles from Keen, Merrell, Blundstone and Columbia, among others, as well as recovery shoes from Birkenstock. “I think picking one identity has helped us. We only carry things people need to be outside,” Gaydosh adds. What are your leading footwear brands? All of our shoe brands are performing well, with Keen and Merrell making up 60 percent of our mix. Hoka and Salomon are also doing well. We’ve also added Blundstone and a bigger selection of Chaco and Teva sandals. In the winter, we’ve added boots from Vasque, Salomon and Columbia. Everybody is looking for lightweight hikers and trail runners—something that doesn’t look like a “hiking boot,” so they can wear it other than on the trail. How’s business this year? We’re a little ahead in sales but way ahead in margins because we’re selling more regularly priced merchandise. Last spring, we were still selling what the previous buyer had bought, but then we picked up a new buyer—my 20-year-old daughter. She’s done a fantastic job of bringing in fresh colors and styles. She’s never bought before, but she’s a natural. She’s still in college and when she’s finished, she may work here full-time. What is the sweet spot for shoe pricing? Around $125. A lot of people don’t realize that Taos isn’t Vail or Aspen or Jackson Hole. If I stocked $280 hiking boots, I would end up eating them. Any unique challenges to Taos? The labor pool, which is more like a labor puddle. It’s tough to find people who want to work, show up on time and have the business’ best interests at heart. Finding the right mix between footwear, gear and clothing is another challenge. About 80 percent of sales are in clothing and footwear, but I need a balance of hard goods that most gearheads love. Then we’re at mercy of weather. If we have no snow, it slows us down a bit. What percentage of your business is tourists? About two-thirds. Under the previous ownership, it was more tourist, but we’re pulling locals back in. It helps us through the slow season. For example, we ordered 15 osprey packs for the Taos Pueblo youth program, and we work with their hunting department to take people out in native lands. We also order safety shoes for Taos’ public works department. I don’t make a fortune on it, but there’s nowhere else in town to order, so they come back every six months. What’s the most effective way to reach your customers? We do Facebook, and we just started an Instagram account. But our biggest draw is being on the Taos Plaza and part of the walking path. We see 300 to 400 people by the afternoon. It’s all location, location, location. What is the smartest business decision you’ve made recently? We don’t keep the store open late on weekends. Last year, we stayed open until 8 p.m., but with the labor issue it was hard finding people to work. Now we’re open 10-6, which was a good idea because when I looked at sales between 6-8, they’re weren’t big enough that you could justify staying open. Why doesn’t TMO sell online? Because we know we can’t compete with Amazon, Moosejaw or Gear Aid. It’s just a David and Goliath situation, and I don’t know if David can slay the Amazon Goliath. They have warehouses that do nothing but order fulfillment, and we don’t have the manpower. Plus, the MAP policies and other rules mean more paperwork, and I don’t want to risk losing any of my brands to mistakenly putting something on sale that shouldn’t be. What are your goals for the rest of this year? We’d like to grow our social media presence—that’s the advertising of the future. I’d also love to hire an assistant GM possibly to take the burden off me and my wife running the day-to-day. We’re also actually doing research on opening another store. We’re not sure when that will happen, but we’re in the preliminary stages of planning. What are you most proud of about TMO? I’m proud that we’re family run, and I’m proud that the first 10 percent of our net profits go to charity. We didn’t come here to get rich, but to have fun and have a positive impact on the community. I have about 100 customers who live in Santa Fe, and they drive 70 miles to Taos to shop in our store rather than stop in an REI, and that’s a big compliment. We’re about an experience and service—we put our customers in the right products, and we’re not here just to sell them something. They like that we’re not forcing stuff down their throats.